It's never been easier – or more rewarding – to bank your way. As part of the Regions Bank Deposit Your Way Sweepstakes, we will randomly select one hundred $100* first prize winners and one $1,000* grand prize winner for each of the months of April, May and June. 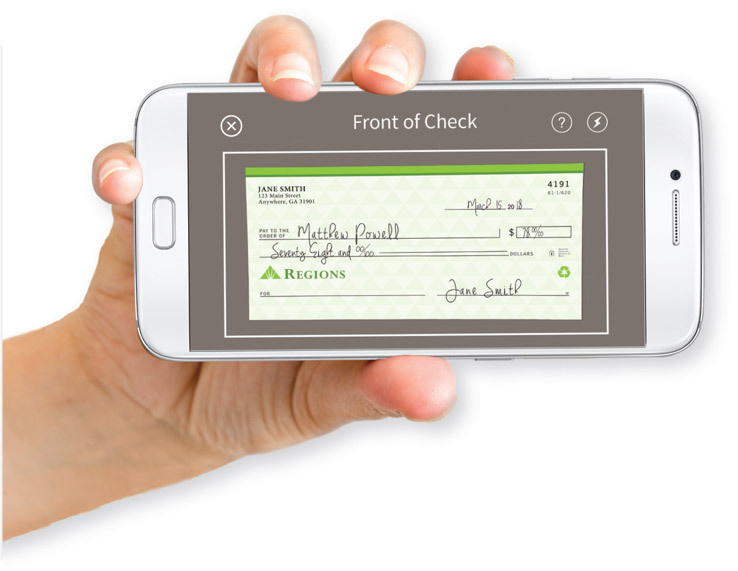 Regions mobile app: Simply make a minimum $10 check deposit to your Regions personal checking, savings or money market account, or load $10 or more to your personal Regions Now Card®. Don't have the Regions mobile app? Just download the app for your specific device and start making qualifying deposits for a chance to win. DepositSmart ATM: Locate your nearest DepositSmart ATM and make a minimum $10 deposit to your Regions personal checking, savings or money market account, or load $10 or more to your personal Regions Now Card®. Start depositing your way and get entered today! For additional Sweepstakes details and Official Rules, including eligibility requirements, how to enter by mail without making a deposit, and how to opt-out (by email) from receiving automatic entries, please see below. *$1,000 grand prize awarded in the form of two (2) $500 Regions Loyalty Visa® Cards (ARV:$1,000); $100 first prize awarded in the form of one (1) $100 Regions Loyalty Visa®® Card (ARV: $100). NO PURCHASE, DEPOSIT OR BANKING RELATIONSHIP NECESSARY. A PURCHASE, DEPOSIT OR BANKING RELATIONSHIP WILL NOT INCREASE YOUR CHANCES OF WINNING. The Regions Bank Deposit Your Way Sweepstakes 2018 is open to legal residents of AL, AR, FL, GA, IL, IN, IA, KY, LA, MS, MO, NC, SC, TN and TX, 18 years or older. Void elsewhere and where prohibited. Sweepstakes begins 4/1/18 and ends 6/30/18 at 11:59 p.m. (CT), and consists of three (3) monthly entry periods as specified in the Official Rules. Limit ten (10) entries per person/per account per monthly entry period, regardless of method of entry. Odds of winning a prize depend on the number of eligible entries received during each monthly entry period. Please see Official Rules for additional Sweepstakes details. Sponsor: Regions Bank, 1900 Fifth Ave. N., Birmingham, AL 35203. | Automatic entries cannot be obtained through Regions business accounts. Your mobile carrier's data fees may apply. Certain Regions Now Card loads are subject to fees, which will be disclosed prior to completion of transaction. To enter Sweepstakes without making a Deposit or Regions Now Card load: Hand print your name, address, day and evening phone numbers, valid email address, and date of birth on a 3" x 5" piece of paper, and mail it during applicable monthly entry period in an envelope with proper postage to "Regions Bank Deposit Your Way Sweepstakes 2018," c/o HelloWorld, Inc., PO Box 5035, Department 835439, Kalamazoo, MI 49003-5035. See Official Rules for additional details. Sweepstakes Automatic Entry Opt Out: If you wish to take any of the above-referenced banking actions without being entered into the Sweepstakes,you may email sweeps@regions.com with the subject line "Regions Bank Deposit Your Way Sweepstakes 2018" and provide your name, full mailing address and the last six (6) digits of your Regions Deposit Account number(s) or Regions Now Card account number, and request that you not be included in the Sweepstakes. See Official Rules for additional details. NO PURCHASE, DEPOSIT OR BANKING RELATIONSHIP NECESSARY. A PURCHASE, DEPOSIT OR BANKING RELATIONSHIP WILL NOT INCREASE YOUR CHANCES OF WINNING. 1. Eligibility: Regions Bank Deposit Your Way Sweepstakes 2018 (the "Sweepstakes") is open only to legal residents of Alabama, Arkansas, Florida, Georgia, Illinois, Indiana, Iowa, Kentucky, Louisiana, Mississippi, Missouri, North Carolina, South Carolina, Tennessee and Texas who are at least eighteen (18) years old at time of entry. Employees of Regions Bank, HelloWorld, Inc., and their parent and affiliate companies as well as the immediate family (spouse, parents, siblings and children) and household members of each such employee are not eligible. The Sweepstakes is subject to all applicable federal, state, and local laws and regulations and is void outside of AL, AR, FL, GA, IL, IN, IA, KY, LA, MS, MO, NC, SC, TN and TX and where prohibited. Participation constitutes entrant's full and unconditional agreement to these Official Rules and Sponsor's and Administrator's decisions, which are final and binding in all matters related to the Sweepstakes. Winning a prize is contingent upon fulfilling all requirements set forth herein. 2. Sponsor: Regions Bank, 1900 Fifth Avenue North, Birmingham, AL 35203. Administrator: HelloWorld, Inc., 3000 Town Center, Suite 2100, Southfield, MI 48075. 3. Timing: The Sweepstakes begins on April 1, 2018 at 12:00 a.m. Central ("CT") and ends on June 30, 2018 at 11:59 p.m. CT (the "Promotion Period") and consists of three (3) monthly entry periods (each a "Monthly Entry Period") as outlined in the chart below. Sponsor's computer is the official time-keeping device for the Sweepstakes. Automatic Entries: You can receive automatic entries in the Sweepstakes if you have an active Regions personal checking, savings or money market account ("Regions Deposit Account") or a personal Regions Now Card® ("Regions Now Card"). Automatic entries cannot be obtained through Regions business accounts. i. Automatic Entries Using the Regions Bank Mobile Banking App: To receive automatic entries using the Regions Bank Mobile Banking App, you must enroll in Regions Online Banking anddownload the Regions Mobile Banking App on a mobile device. Follow the links and instructions to log into your Regions Deposit Account or into your Regions Now Card, locate Mobile Check Deposit and follow the instructions to complete a minimum $10 check deposit or Regions Now Card loading transaction. You automatically will receive one (1) entry into the applicable Monthly Entry Period drawing for each qualifying check deposit or Regions Now Card load transaction. If you use your mobile device to complete a qualifying deposit/load transaction, your mobile carrier's data fees may apply. All Regions Now Card loads using the Regions Bank Mobile Banking App are subject to fees, which will be disclosed prior to your completion of the transaction. ii. Automatic Entries Using a Regions DepositSmart ATM or Video Banking ATM: To receive automatic entries at any Regions DepositSmart ATM or Video Banking ATM (VTM), follow the instructions to log in and access your Regions Deposit Account or your Regions Now Card. Next, follow the instructions to complete a minimum $10 deposit into your Regions Deposit Account or load onto your Regions Now Card. All deposits made during a single ATM log-in are treated as one deposit regardless of numbers of checks or combination cash and check deposits. You automatically will receive one (1) entry into the applicable Monthly Entry Period drawing for each ATM log-in with a qualifying deposit or Regions Now Card load transaction. All Regions Now Card loads using checks at Regions ATMs are subject to fees, which will be disclosed prior to your completion of the transaction. For Regions Deposit Accounts or Regions Now Cards jointly owned or opened, the primary account holder as reflected in Region's records will receive the entry into the Sweepstakes, and any other account holder on the joint account may enter the Sweepstakes via the Mail-in Alternate Method of Entry outlined below. Sweepstakes Automatic Entry Opt Out: If you wish to take any of the above actions without being entered into the Sweepstakes, you may email sweeps@regions.com with the subject line "Regions Bank Deposit Your Way Sweepstakes 2018" and provide your name, full mailing address and the last six (6) digits of your Regions Deposit Account number(s) or Regions Now Card account number, and request that you not be included in the Sweepstakes. Your Opt-Out request must be received by 11:59 p.m. CT on the End Date of the applicable Monthly Entry Period (set forth in the table in Section 3) in order for your automatic entries to be removed from the drawing for that Monthly Entry Period (and all subsequent Monthly Entry Period drawings held thereafter). Mail-in Alternate Method of Entry: To enter without making a deposit using the mobile app or ATM, hand print your name, address, day and evening phone numbers, valid email address, and date of birth on a 3" x 5" piece of paper and mail it in an envelope with proper postage to "Regions Bank Deposit Your Way Sweepstakes 2018," c/o HelloWorld, Inc., PO Box 5035, Department 835439, Kalamazoo, MI 49003-5035. You will receive one (1) entry into the applicable Monthly Entry Period drawing. Limit: One (1) entry per envelope. All mail-in entries must be handwritten and must be postmarked and received by the dates outlined in the table in Section 3. All entries become the exclusive property of Sponsor and none will be acknowledged or returned. Proof of sending or submission will not be deemed to be proof of receipt by Sponsor. Sponsor is not responsible for lost, late, incomplete, invalid, unintelligible, illegible, misdirected or postage-due entries, which will be disqualified. Limit: Limit of ten (10) Sweepstakes entries per person/per account per Monthly Entry Period, regardless of method of entry. Any attempt by any person to obtain more than the stated number of entries by using multiple/different identities, accounts or any other methods will void that entrant's entries and that entrant may be disqualified. Use of any automated system to participate is prohibited and will result in disqualification. 5. Drawings: Administrator is an independent judging organization whose decisions as to the administration and operation of the Sweepstakes and the selection of the potential winners are final and binding in all matters related to the Sweepstakes. On or around the date set forth in the table in Section 3, Administrator will conduct a drawing for each Monthly Entry Period and randomly select the potential winners from all eligible entries received during each such Monthly Entry Period. Non-winning entries from a Monthly Entry Period drawing will not be included in subsequent Monthly Entry Period drawings. The potential winners will be notified by email, mail or phone. Each potential Grand Prize winner (and winner's parent/legal guardian, if winner is a minor in his/her state of residence) will be required to sign and return a Declaration of Compliance, Liability Waiver and, where not prohibited, Publicity Release ("Declaration") which must be received by Sponsor or its representative within fourteen (14) days of the date notice or attempted notice is sent, in order to claim his/her prize. If a potential winner of anyprize cannot be contacted, fails to sign and return the Declaration (if necessary) or provide any other requested information within the required time period, or the prize is returned as undeliverable, the potential winner forfeits his/her prize. Receiving a prize is contingent upon compliance with these Official Rules. In the event that a potential winner is disqualified for any reason, Sponsor will award the applicable prize to an alternate winner by random drawing from among all remaining eligible entries. Up to three (3) alternate drawings will be held, after which the prize will remain un-awarded. Prizes will be fulfilled by mail approximately 12-14 weeks after the end of each Monthly Entry Period. 6. Prizes: THREE (3) GRAND PRIZES (ONE (1) GRAND PRIZE AWARDED FOR EACH MONTHLY ENTRY PERIOD): Two (2) $500 Regions Loyalty Visa® Cards. Approximate Retail Value ("ARV") of Grand Prize: $1,000. THREE HUNDRED (300) FIRST PRIZES (ONE HUNDRED (100) FIRST PRIZES AWARDED FOR EACH MONTHLY ENTRY PERIOD): One (1) $100 Regions Loyalty Visa® Card. ARV of First Prize: $100. For all Prizes: The Regions Loyalty Visa Card is a non-reloadable, prepaid card issued by Regions Bank and is not a credit card, gift card, charge card or bank account debit card; visit regions.com/virtualDocuments/Regions-LoyaltyCard-TermsAndConditions.pdf for Regions Loyalty Visa Card Terms and Conditions. Any difference between the actual value of any prize and the approximate retail value set forth in these Official Rules may not be claimed and will not be awarded. Prizes are non-transferable and no substitution will be made except as provided herein at the Sponsor's sole discretion. Sponsor reserves the right to substitute a prize for one of equal or greater value if the designated prize should become unavailable for any reason. Winners are responsible for all taxes and fees associated with prize receipt and/or use and may be subject to withholding. Odds of winning a prize depend on the number of eligible entries received during each Monthly Entry Period. Limit: one (1) prize per person. Total ARV of all prizes: $33,000. 7. Release: By entering, entrants agree to release and hold harmless Sponsor, Administrator, and their respective subsidiaries, affiliates, suppliers, distributors, advertising/promotion agencies, agents, and prize suppliers, and each of their respective parent companies and each such company's officers, directors, employees and agents (collectively, the "Released Parties") from and against any claim or cause of action, including, but not limited to, personal injury, death, tax liability, or damage to or loss of property, arising out of participation in the Sweepstakes or receipt or useor misuse of any prize. 8. Publicity: Except where prohibited, participation in the Sweepstakes constitutes each winner's consent to Sponsor's and its agents' use of winner's name, likeness, photograph, voice, opinions and/or hometown and state for promotional purposes in any media, worldwide, without further payment or consideration. 9. General Conditions: Sponsor reserves the right to cancel, suspend and/or modify the Sweepstakes, or any part of it, if any fraud, technical failures, human error or any other factor impairs the integrity or proper functioning of the Sweepstakes, as determined by Sponsor in its sole discretion. In such event, Sponsor, in its sole discretion, may elect to hold a random drawing from among all eligible entries received up to the date of discontinuance for any or all of the prizes offered herein. Sponsor reserves the right, in its sole discretion, to disqualify any individual it finds to be tampering with the entry process or the operation of the Sweepstakes or to be acting in violation of the Official Rules of this or any other promotion or in an unsportsmanlike or disruptive manner. Any attempt by any person to deliberately undermine the legitimate operation of the Sweepstakes may be a violation of criminal and civil law, and, should such an attempt be made, Sponsor reserves the right to seek damages from any such person to the fullest extent permitted by law. Sponsor's failure to enforce any term of these Official Rules shall not constitute a waiver of that provision. 10. Limitations of Liability: The Released Parties are not responsible for: (1) any incorrect or inaccurate information, whether caused by entrants, printing errors or by any of the equipment or programming associated with or utilized in the Sweepstakes; (2) technical failures of any kind, including, but not limited to malfunctions, interruptions, or disconnections in phone lines or network hardware or software; (3) unauthorized human intervention in any part of the entry process or the Sweepstakes; (4) technical or human error which may occur in the administration of the Sweepstakes or the processing of entries; (5) late, lost, undeliverable, damaged or stolen mail or notices; or (6) any injury or damage to persons or property which may be caused, directly or indirectly, in whole or in part, from entrant's participation in the Sweepstakes or receipt or useor misuse of any prize. If for any reason an entrant's entry is confirmed to have been erroneously deleted, lost, or otherwise destroyed or corrupted, entrant's sole remedy is another entry in the Sweepstakes, if it is possible. No more than the stated number of prizes will be awarded. In the event that production, technical, seeding, programming or any other reasons cause more than the stated number of prizes as set forth in these Official Rules to be available and/or claimed, Sponsor reserves the right to award only the stated number of prizes by a random drawing among all legitimate, un-awarded, eligible prize claims. 11. Disputes: Except where prohibited, entrant agrees that: (1) any and all disputes, claims and causes of action arising out of or connected with this Sweepstakes or any prize awarded shall be resolved individually, without resort to any form of class action, and exclusively by the United States District Court for the Eastern District of Michigan (Southern Division) or the appropriate Michigan State Court located in Oakland County, Michigan; (2) any and all claims, judgments and awards shall be limited to actual out-of-pocket costs incurred, including costs associated with entering this Sweepstakes, but in no event attorneys' fees; and (3) under no circumstances will entrant be permitted to obtain awards for, and entrant hereby waives all rights to claim, indirect, punitive, incidental and consequential damages and any other damages, other than for actual out-of-pocket expenses, and any and all rights to have damages multiplied or otherwise increased. All issues and questions concerning the construction, validity, interpretation and enforceability of these Official Rules, or the rights and obligations of the entrant and Sponsor in connection with the Sweepstakes, shall be governed by, and construed in accordance with, the laws of the State of Michigan without giving effect to any choice of law or conflict of law rules (whether of the State of Michigan or any other jurisdiction), which would cause the application of the laws of any jurisdiction other than the State of Michigan. 13. Winner List: For a winner list, visit http://bit.ly/2CS1fss . The winner list will be posted after winner confirmation is complete. This Sweepstakes is in no way sponsored, endorsed or administered by, or associated with, Visa U.S.A. Inc. This Sweepstakes is in no way sponsored, endorsed or administered by, or associated with Apple, Inc., Amazon Digital Services LLC, Google Inc., or their respective affiliates (collectively, the "Third Parties"). You understand that you are providing your information to the Sponsor and not any of the Third Parties. You hereby release, to the full extent permitted by law, the Third Parties from all liability related to the Sweepstakes. Questions and comments regarding the Sweepstakes should be directed to the Sponsor and not to the Third Parties.